National reaction to Rodgers' injury: Was Barr's hit dirty; are Packers finished? In one play during the first quarter, The Packers went from Super Bowl contenders to scrambling to reassemble their season after Aaron Rodgers wasinjured. A seemingly harmless play Sunday could turn out to be the defining on-field moment in the NFL this season. 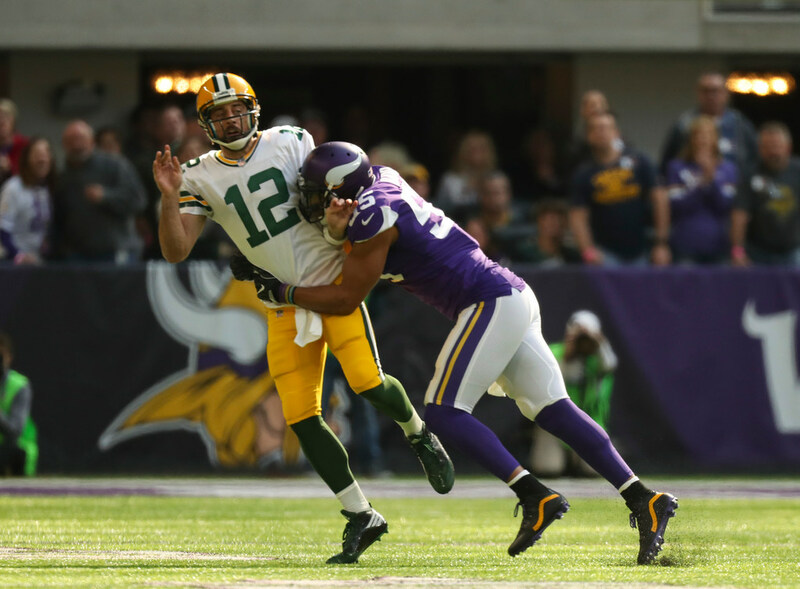 Vikings linebacker Anthony Barr followed through and tackled Packers QB Aaron Rodgers after he delivered a pass early in the Vikings’ 23-10 victory over Green Bay at U.S. Bank Stadium. Rodgers came down on his shoulder, breaking his right (throwing side) collarbone in the process. The problem this time around isn’t just Rodgers; the Packers have been ravaged by injuries. … It’s not like they have an unstoppable running game for (backup Brett) Hundley to rely on, either. … The Packers have relied heavily on Rodgers all season. Entering Week 6, they had the second-highest dropback percentage in the NFL at 71 percent, according to ESPN Stats & Information. Maybe the outlook won’t appear to gloomy when the sting of this day wears off, but if the Packers can’t beat with a team quarterbacked by (Case) Keenum, who was without his best receiver (Stefon Diggs), then maybe this will be even worse than 2013. The Packers were early in what had all the signs of a very, very promising season. Rodgers looked like a man on a mission through five weeks. He might have been on his way to another MVP year. And there was some young talent on defense that had a chance to develop and at least make that side of the ball good enough to win a championship. But Sunday might have dealt that a mortal blow. Odds are, Rodgers is finished for the season, and if that’s the case, so are the Packers. USA Today’s For The Win site shows us how upset Rodgers was at Barr after the hit. It was a borderline hit by Vikings LB Anthony Barr that caused the injury, and Rodgers was understandably upset about it. After being helped off the field, the Packers QB let Barr hear it. … A completely avoidable hit will sideline one of the league’s best players for months. Michael David Smith, writing for Yahoo.com, said he thinks Barr’s hit — while legal — should prompt the NFL to consider changing the rules for how quarterbacks are treated in the wake of Rodgers’ injury. Robert Mays of The Ringer notes that the NFL has seen a ton of star players injured already this season, with Rodgers being the latest casualty. The players lost during the past week or so aren’t just some of the game’s best. They’re also some of its most transcendent, the ones who managed to break through the relative anonymity that besets most guys wearing helmets. They’re featured in commercials for shampoo, car insurance, and headphones. Losing so many players in that tier presents yet another challenge for a league already facing questions about its appeal.